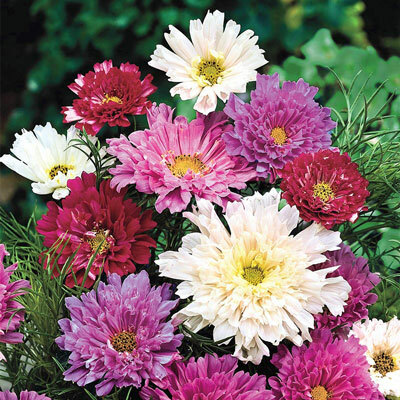 Double Click Cosmos | Henry Field's Seed & Nursery Co.
For each offer ordered, get approx. 30 seeds per packet. Spacing: 9 - 24 inches. Spread: 24 - 30 inches. Color: Red, pink and white flowers. Foliage: Very finely cut lacy, green foliage. Blooms: June - October until first hard frost. Flower Form: Frilly double blooms. Soil Requirements: Dry, well-drained soil. Size: 2 - 6 inches.